CHICAGO – All is lost. It’s is a phrase uttered by countless adventurers across human history. It speaks of resignation and despair. We hear it in voiceover during PBS documentaries when the narrator reads someone’s diary or letter to explain the last little bit of a fellow human’s final stand against nature or the ardors of travel. But in this masterful film by writer/director/producer J.C. Chandor, those three words become a homily inviting the viewer to simply watch and contemplate their own adventure and whether they are living well. The adventurer in this story is unnamed and played by Robert Redford in a role that offers no dialogue. Scant voiceover narration and a brief radio interaction are the only moments that offer a human voice. Instead, Chandor chooses to sell the story via Redford’s masterful, understated performance and his own impressive grasp of how to visually showcase the elements and combine the techniques that make his version of the story possible. The film makes a strong debut on Blu-ray by offering stunning visuals and high detail. The many extras included are all solid as they offer insight into what must have been an intensely difficult – even daring – shoot for the 77-year-old actor. During a solo trek across the Indian Ocean, an older man wakes up to discover his boat taking on water. Moving quickly to patch the leak and repair his navigation and communications equipment, he is sideswiped by one calamity after another until chance throws him and his vessel into a disastrous storm. Slowly reduced to only the barest of resources and his own innate seamanship, he begins to realize the true nature of his journey. 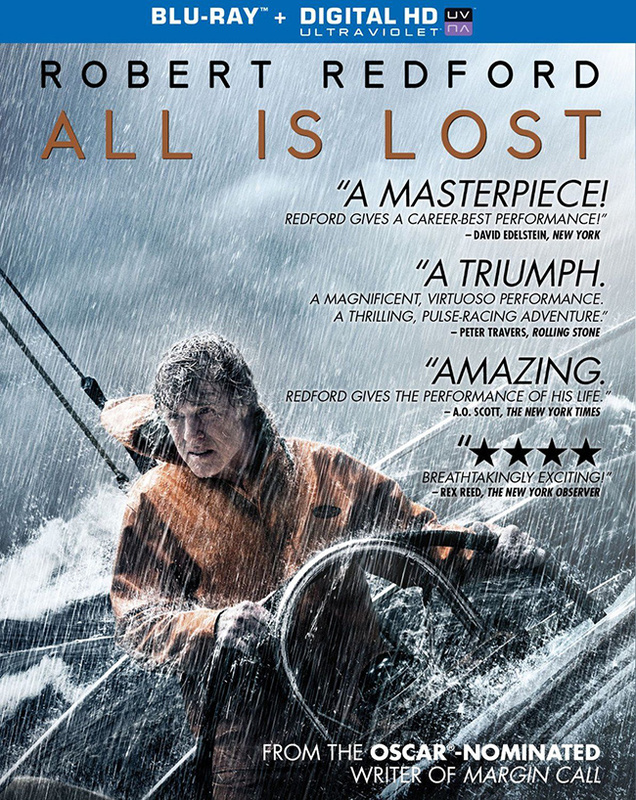 “All is Lost” stars Robert Redford. It was released on Blu-ray and DVD on Feb. 11, 2014.